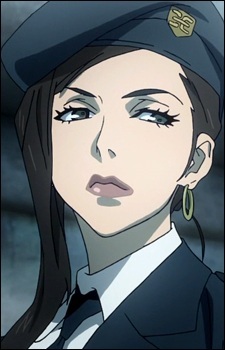 Senior leader of the prison's guard staff, Makina is a harsh and cold enforcer which does not hesitate in punishing, often brutally, the prison's population. Known for her demeanor and her large breasts (G cup), she is infamous for carrying a decorated sword with herself at all times, and also for using it to cut whoever breaks the prison's rules, acts that almost always result in bloodshed. Despite her brutality she is far less twisted than Tamaki, whom she is greatly suspicious of, especially after discovering that she knows and has authority over only a part of Deadman Wonderland. This fact, coupled with Tamaki's ever more sick machinations, led her to forfeit her position and hunt him down with the aid of some allies, among them the Deadmen themselves, Ganta in particular. After the death of Tamaki, she came in possession of the data regarding the Wretched Egg, the Deadmen and the Forgeries.